HAPPY Easter Mates and I hope you all have an awesome weekend in The Shire. It will be a massive weekend as always with the Blues Festival kicking off with some insane sounds up there over the next few nights and gumboots are always a must if we are getting the rain that has been forecast. Easter is also a good time to get into some surfing action as we always get a pulse of swell rolling in for the long weekend. The sandbanks have shaped up at most of the beaches and there is an Easterly swell forecast to build over the next few days with some east to south east winds coming. THE Rip Curl Pro at Bells Beach was also scheduled to start yesterday down at Bells and there is a solid swell that may be around the corner. NEW Brighton Board Riders held its second contest for the year on Sunday April 14 and conditions were super fun with clean, offshore winds and a nice two foot swell. It was a great turn out of all age groups from under 10's to Masters. Under 10 Boys: 1st Jarrah Davidson, 2nd Asher, 3rd Rocco Davidson, 4th Sunny Waters. Under 10 Girls: 1st Tully Harper, 2nd Kamaile Simpson, 3rd Zami Mack, 4th Lilu Lorente. Under 14 Boys: 1st Taylor Simpson, 2nd Samahdi Hoerstmann, 3rd Zeb D, 4th Leon Weir. Under 14 Girls: 1st Skye Waters, 2nd Lala Davidson. Under 18 Boys: 1st Lior Dadon, 2nd Grayson Barnard, 3rd Joel Holt, 4th Finley Neylan. Female Opens: 1st Tanya Smith, 2nd Barb Underwood, 3rd Ruby Waters, 4th Lydia Burth-Weir. Men's Open: 1st Mark Ridgway, 2nd Dave Anderson, 3rd Dave Lucas, 4th Toby Williams. Men's Masters: 1st Rob King, 2nd Matt Underwood, 3rd Chris Harper, 4th Toby Sandison. 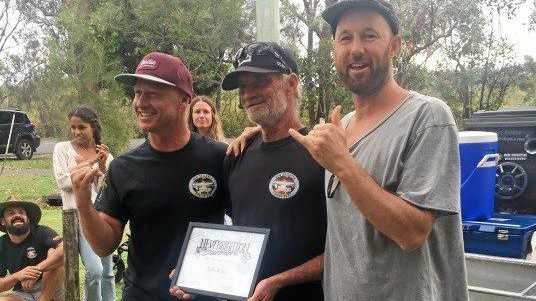 A big shout out to Rob King who was awarded a Lifetime Membership Of New Brighton Board Riders for his contribution and ongoing support. THE Byron Bay Malibu Classic is next weekend, the Clubs main event of the year. Always held at Wategos this contest attracts competitors from up and down the east coast and from New Zealand. The money raised through the generosity of the Classic's sponsors and competitors has enabled the club to donate well in excess of a quarter of a million dollars to local community organisations over the years. Max and Von are at it again with McTavish Surfboards again sponsoring the Future Legends. Organisers would also appreciate donations from local businesses or individuals of items such as stickers and wax and small surfing accessories suitable that could be included in the give away bags that are the prizes awarded to each and every competitor. To donate contact Max and Von at Facebook Byron Bay Surf Safety. Numbers will be limited this year so get in quick. Surfing Lessons are best booked at the Quiksilver Surf Shop at the top of town. Happy Days & Catch you in the waves.